The graphics are interactive. Users can hover over the visual icons–this highlights the other cases that cite the hovered over case. Clicking a case icon isolates the cases that reference that particular “clicked” case. On both hover over and click, lines appear connecting all the associated cases, making a spider web of referential material. Also, arrows will appear on the connecting lines, articulating which case is being cited, and which case is doing the citing. On the right portion of the screen, users can click the actual text of the case law associated with the graphic and read the full text in Ravel’s unique environment, which we will get to in a second. Again, underneath the hood, Ravel’s graphic presentations are based on the number of citational references the case law has received. The display of the results can be organized into many different filters. 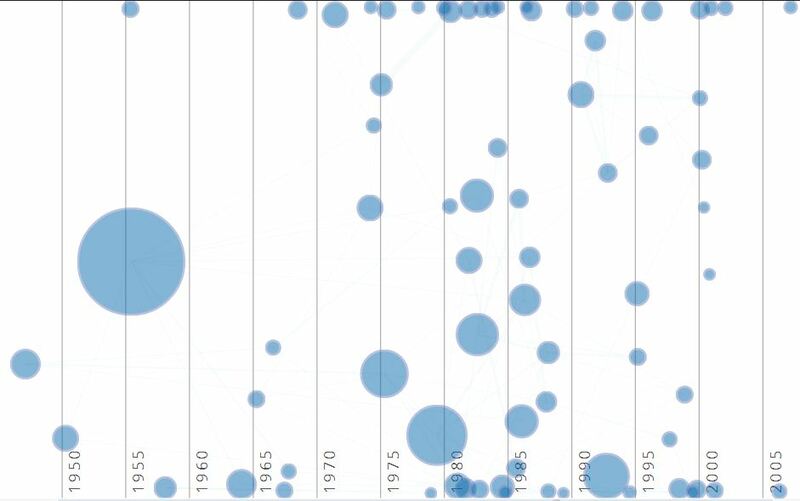 “Ravel” is the default view, however users can click the following: “Court” to separate the clusters of opinions into what level of appellate court they were levied in, “Relevance” to change the visualization to have the most relevant cases in order from top to bottom (while still conforming to the date they were published, on the x-axis), and “Cluster” to re-align the cases to have citing cases orbit the cases they cite, and therefore make them easier to click. After a user clicks into a cited case in the right margin, they are navigated to Ravel’s case law reading screen. Ravel has incorporated various tools into this particular view. In the text of the case law itself, after a user clicks-and-drags to select text, a sub-menu will appear enabling the user to “Copy”, “Highlight”, “Annotate”, or “Copy with Cite” the highlighted text. This enables the user to make notes while reading through the case law. The left portion of the case law reading screen contains the citational information for additional cases that have cited the portion of the text the user is currently viewing. These citational references can be sorted by date or rank by clicking the appropriate button. And these references appear at the case law’s numerous page breaks–for example, the image to the left shows how page 324 displays for the case LAWLOR v. NATIONAL SCREEN SERVICE, 349 U.S. 322, immediately under the page break (p. 324) is a list of other case law that cites this page. Again, on the case law reading screen, at the very top of the right column, a graphic displays all the opinions that cite the particular case law the user is currently viewing. This is a lot of information packed into this particular visualization–the blue spikes in the graph correspond to the total number of how many different opinions have cited this piece of case law. 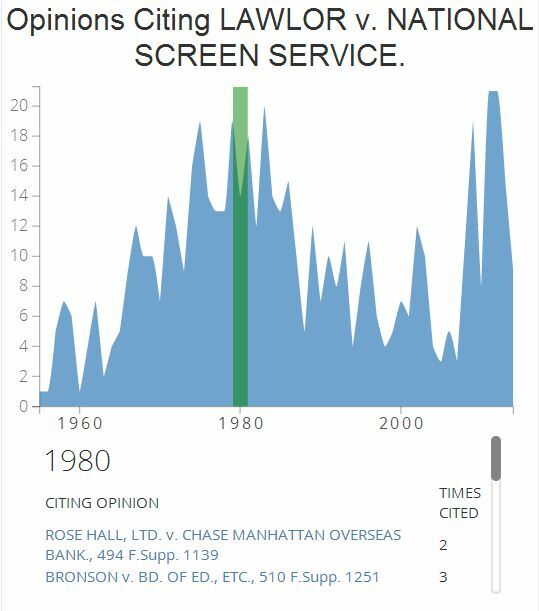 When a year is hovered over (with the green highlight bar indicating which year is being hovered over), the list under the graph is populated with the names of the specific opinions that have cited this case law. 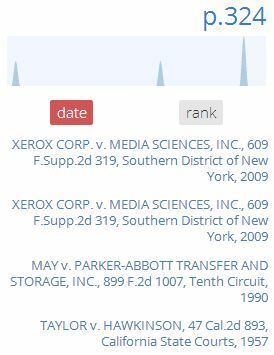 In the above example, 1980 is being hovered over, and the list is populated with cases from 1980 that have cited LAWLOR v. NATIONAL SCREEN SERVICE. Though full access requires a premium account, if you are interested, you can sign up and tour through the site for free; the price for the premium account is not listed on Ravel Law’s website. Ravel Law provides an interesting alternative to Westlaw’s KeyCite and Lexis’s Shepard’s, with a forward-thinking emphasis on visualization and incorporating more technology and computer power into legal research. This entry was posted in Reviews and tagged Case Law, Citation, Court Opinion, KeyCite, Lexis, Opinion, Ravel, Ravel Law, Res Judicata, Shepard's, Westlaw. Bookmark the permalink.